While there are many technology companies flexing their muscles and trying to gain the top position, it was only RIAXE that was able to achieve the feat. 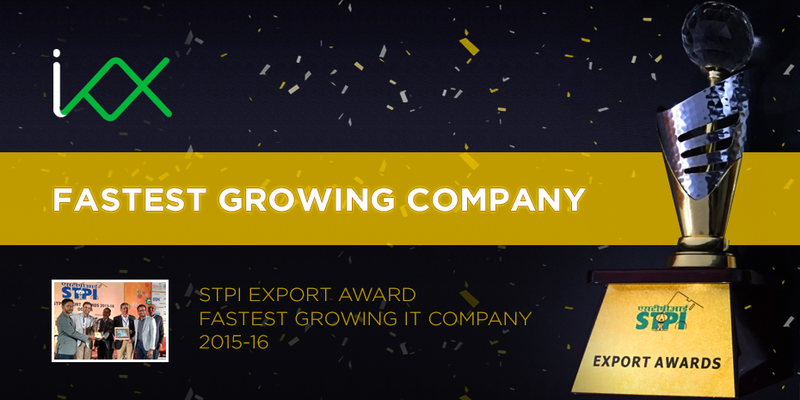 As a testimony to the remarkable levels of growth, we received the award for Fastest Growing IT Company 2015-16. It was award by the Software Technology Parks of India (STPI) group. 2016 has been a year of many breakthroughs for RIAXE. We were successfully able to make our flagship product ‘inkXE’, a product designer tool, increasingly sophisticated and e-commerce business-friendly. Whereas we gained clients from the east coast of Australia to the west coast of US, thereby covering all time zones. Also, our revenue grew manifolds this year. Every year, RIAXE designs and develops hordes of products that help businesses optimize their services. No matter what industry you’re in, your company needs an intelligent solution and RIAXE excels at that. It is this consistency and dedication that has helped us bag the award of region’s fastest growing IT company. Now in its 9th year, RIAXE aims to empower enterprises – both startups and established players – to move at the speed of light with its cutting-edge solutions. The award was received together by cofounders Subrat Acharya and Susrut Mishra, on March 9 at Hotel Crown.